Hillary Clinton's Free Tuition Promise: What Would It Cost? How Would It Work? : NPR Ed This proposal is novel and dramatic: a broadly scaled entitlement program for the middle class directed not at older people, like Social Security and Medicare, but at younger Americans. Clinton's Free-Tuition Promise: What Would It Cost? How Would It Work? "During the primary campaign, Secretary Clinton and I both focused on this issue but with different approaches," the Vermont senator noted. "Recently, however, we have come together on a proposal that will revolutionize higher education in America. It will guarantee that the children of any family [in] this country with an annual income of $125,000 a year or less — 83 percent of our population — will be able to go to a public college or university tuition-free. 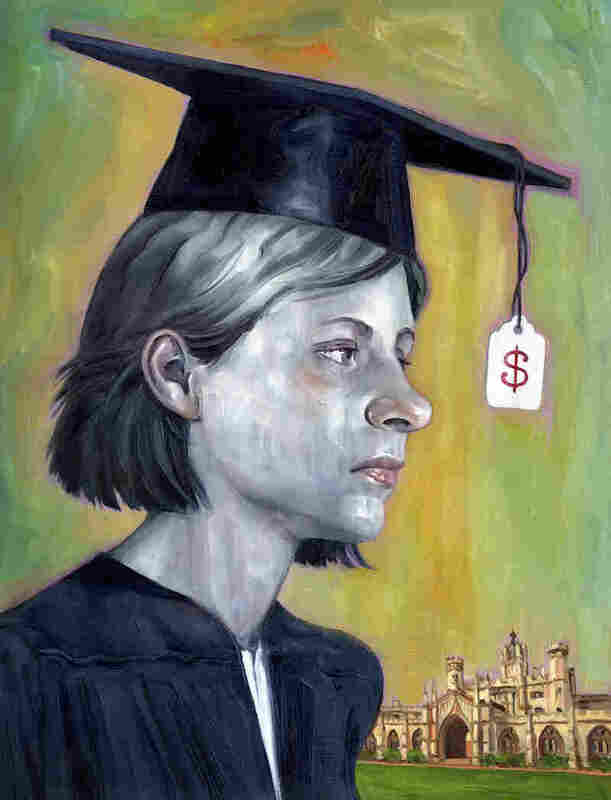 That proposal also substantially reduces student debt." This proposal is novel. It's dramatic. It's a broadly scaled entitlement program for the middle class directed not at older Americans, like Social Security and Medicare, but for once, at younger Americans. So let's unpack this idea a little bit. First of all, what would it cost? In fiscal year 2014, the most recent year available, four-year public institutions collected $58 billion in tuition. Since 2011, they've collected more in tuition and fees than from all state sources combined. Currently, the federal government spends $31 billion on federal grants and work-study to all institutions, not just four-year public schools. So the cost of eliminating tuition would be around double that (maybe less, since some of that grant money already goes to tuition). The Sanders campaign had previously estimated the cost of free college for all at $75 billion and proposed a tax on Wall Street transactions to pay for it. But when you're talking about government subsidies for anything, the math isn't simple. States have relied on large annual tuition increases for decades. Tuition has risen 40 percent in the past 10 years at four-year public colleges and universities, as Hillary Clinton's campaign notes. To avoid signing a federal blank check that rises each year, Clinton's platform talks about getting buy-in from colleges and states to rein in costs. The Department of Education might use accreditation or eligibility for federal financial aid as carrots or sticks to encourage states to keep tuition low. The federal promise of free tuition is also complicated by the diversity of our public institutions. The University of Pittsburgh, the most expensive four-year university for in-state students, charged $18,192 in tuition last year. At the other end of the spectrum, Bismarck State College in North Dakota charged $4,222. That's a pretty wide range. Would the federal subsidy be flat, like a student voucher, set somewhere in the middle? Would the deal allow colleges to raise extra revenue by charging a premium to out-of-state students, or by raising costs for room and board (adding perks to sweeten the deal)? Those public colleges that have the prestige to market themselves are already using both of these strategies to get more cash. But they reinforce a dynamic of haves and have-nots, as detailed in the 2013 sociology book Paying for the Party. The majority of students are living off-campus and working their way through, while a privileged few living on campus have more free time to party, get involved in extracurriculars and make the social connections that will lead them to future opportunities. Eliminating four-year college tuition would inevitably mean handing free money to some families that can afford to pay. That's already been seen in states like Georgia that created statewide scholarship programs with entrance requirements. Studies found that wealthier students were more likely to have the grades and family support to take advantage of free tuition. On the other hand, the current means-tested financial aid program requires low-income students to jump through lots of hoops, like dealing with the daunting FAFSA form, to prove their status and maximize their aid. Many can't navigate the system and fall out along the way. "Free tuition" is a simple promise that some researchers, like Sara Goldrick-Rab at Temple University, believe would motivate more working-class students to dream of college and actually make it through. The maxim for generations of policy wonks is that "programs for the poor are poor programs," while those with more universal eligibility enjoy broader support. In embarking on a promise of free tuition for 83 percent of families, Clinton's campaign seems to be banking on the idea that the appeal to middle-class parents and millennials will outweigh the protests of other taxpayers who ask, "What's in it for me?" But within Clinton's higher-ed proposals, there is a less dramatic, cheaper and more targeted alternative to free four-year tuition for all, and that's free community college. Around half of America's college graduates spend some time at our public two-year colleges. Since the Obama administration first proposed the idea a few years ago, several states, including Tennessee, Oregon and Minnesota, have started free-community-college programs, and others are considering it.